This can typically be a time that controversial measures have a chance to be called: On the heels of the election, the General Assembly is packed with more than 30 so-called lame ducks who won’t be returning to Springfield – and therefore don’t have to worry about winning their next campaign. But this year, there’s no need to rush controversial measures through; come January, Democrats will control both the governor’s mansion and they’ll hold supermajorities in both the Illinois House and Senate – margins that, should the party stay unified, will easily allow Democrats to pass whatever laws they want. He told reporters he’s had several “very friendly and very productive” conversations with Gov.-elect J.B. Pritzker since last week’s election, and that he backs two of Pritkzer’s major campaign promises – legalizing marijuana, and moving from a flat to a graduated income tax. In other activity at the statehouse Tuesday, lawmakers were visited by former President Abraham Lincoln – or rather, an Abe impersonator. There’s controversy over whether a stovepipe hat that’s been displayed at the Abraham Lincoln Presidential Museum is authentic. The library and museum foundation took out a loan to purchase a collection that includes the hat, but is having trouble paying it back and wants millions of dollars from the state. Lawmakers are undecided on whether to help. Some say it’s important all artifacts remain in Lincoln’s adopted hometown, while others question the foundation’s choices, particularly as it’s not held to the same transparency standards as a public body. While Rauner used his veto pen on dozens of bills, lawmakers didn’t deal with them on Tuesday. 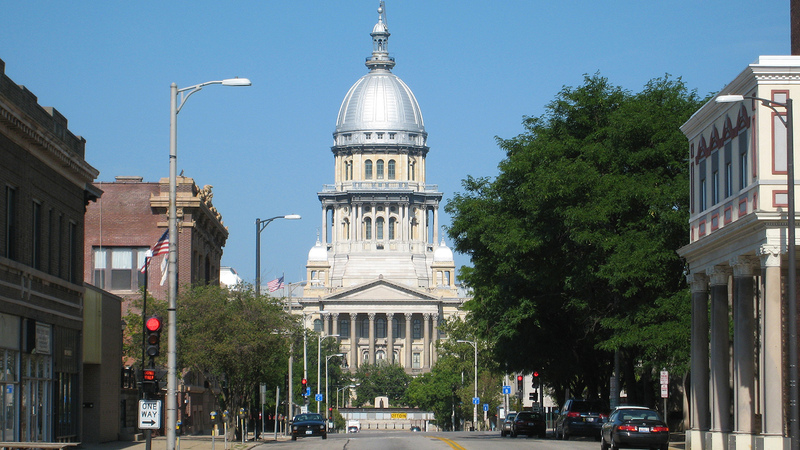 However, they may begin to decide Wednesday whether to override Rauner’s changes to Senate Bill 2641. The measure would make peer-to-peer car rentals (think of it a little like calling an Uber, but instead of getting a ride, borrowing – or renting – someone’s car) pay the same taxes and meet the same standards as mainstay car rental companies, whether big ones like Hertz or smaller operations. Car rental companies are calling for lawmakers to override Rauner’s changes, so as to make the original measure law. Despite suffering losses within their ranks, Republican members of the Illinois Senate and House met in private to unanimously re-elect Sen. Bill Brady of Bloomington and Rep. Jim Durkin of Western Springs as their respective leaders.